LAVA CRICKETS: Mysterious insect colonizes sterile Kilauea volcano lava fields, baffling scientists! A strange life form has appeared on the barren lava fields left by last year’s eruption of the Kilauea volcano on the Big Island of Hawaii. How this poorly understood insect manages to thrive in a harsh, sterile landscape when virtually nothing else can is a mystery. Prepare for the lava cricket invasion! For three months beginning last May, the Kilauea volcano oozed enough lava to cover more than 13 square miles, destroying at least 700 homes on Hawaii’s Big Island. Scientists are headed to Hawaii this week to study what many biologists think is the first multicellular life form to make a home in the harsh, sterile lava fields: Caconemobius fori, the lava cricket. “There’s the lava and the scape of this barren land, and then there’s this cricket,” Marlene Zuk, an entomologist leading the study, told Science Magazine. 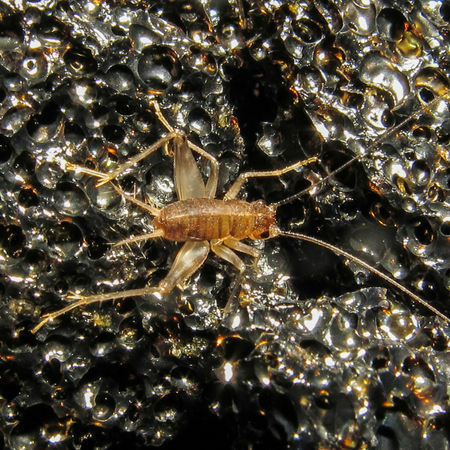 Little is known about the crickets, called ‘ūhini nēnē pele in Hawaiian. Scientists first described them in 1978, four years after Frank Howarth, an entomologist with Honolulu’s Bishop Museum, trapped about 150 of them in old wine bottles. The entomologists learned the crickets survive on bits of decaying plants that blow into the lava fields, and albumen proteins in sea foam. They remain on the lava fields only until plants begin to grow again. Where the crickets live between eruptions remains a mystery. lack wings, so they can’t make music to woo a mate. How this poorly understood insect manages to thrive in a harsh, sterile landscape when virtually nothing else can is a mystery. Are these LAVA CRICKETS living in hot magma?